It's getting cold out which means one thing. Comfort food. Nothing makes me happier in the kitchen than cooking big pots of food that I can feed to my friends, these dishes not only go further on the plate but I always find them to be cheaper at the check-out too. 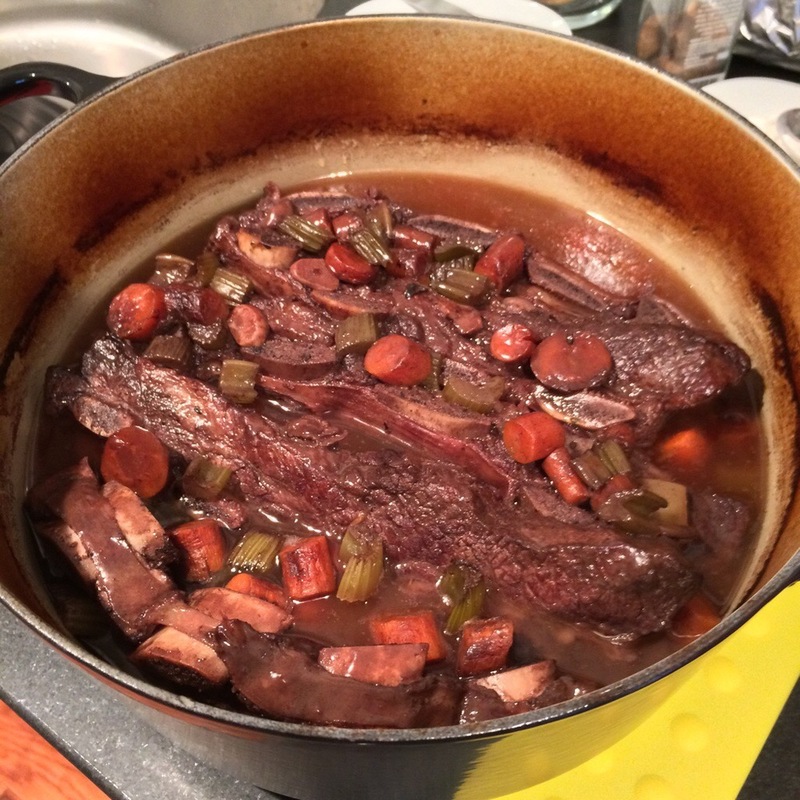 Like the tomato sauce, I adapted the short-ribs from a Tom Colicchio recipe and have worked on them over the years to how I like them, but they can easily be adapted to individual preference. And after having multiple requests from friends for the recipe it's about time I make a blog post about them. This recipe is in two parts, there are the short-ribs which can be served with a big heaping of buttery mashed potatoes, or they can be used to make the lasagna. Which you will want to make. I promise not to steer you wrong. The short-ribs are meaty, juicy and superbly tender. There's no better fall-of-the-bone kind of meat than these, slowly cooked in their own juices, wine and spices the flavor falls together to make a perfect dish. I was conflicted at first, combining them into a lasagna, I still am - it's like mixing a good Bourbon with ginger, it works but are you really sure you want to do it. But how can you not love pasta, tomato sauce, meat and cheese. You be the judge. Heavily season the short-ribs with salt and pepper, in a skillet heat the extra-virgin olive oil and cook on medium heat until brown, turning on all sides. About 15-20 minutes. Transfer ribs to an oven proof dish. In the same skillet cook the carrots, celery and garlic for a few minutes. Pour in the wine, the stock or tomato juice (I reserved the juice from the tomato sauce, but I've used stock in the past and works just as great), and reduce to half. Scraping the bottom of the pot with a wooden spoon to get the good bits. Pour over the ribs evenly, cover with foil and refrigerate overnight. Up to 24 hours. Transfer the ribs and liquid into a heavy cast iron pot, this is where my Le Creuset dutch oven comes in handy. Bring the liquid to a boil and place in a 350 degree pre-heated oven, covered for 1 hour and 45 minutes. Remove cover and turn the ribs, cook for an additional 30-45 minutes. Remove from the oven and transfer the ribs and sauce to an oven proof dish, removing the bones. The bones should fall away easily. It's at the point you have a stand alone short-rib dish. You can stop here and serve as they are. But that's not what we're doing. Let's keep going to make that lasagna. Once you have the meat, sauce and vegetables separated from the bones place in a pot on the stove, pour in enough tomato sauce to desired consistency. You are the judge here, I added enough to coat the meat with a little bit more for added flavor. Simmer on the stove while you prepare the Mornay sauce for the lasagna. In a saucepan melt the butter, stirring in the flour until it turns to a yellow almost frothy texture. Usually about a minute. Slowly whisk in the warmed milk until it thickens, add in a pinch of salt and pepper and a few grates of the nutmeg. Taste, add more if desired. Simmer for a couple of minutes then stir in the Parmesan, adding more milk if it becomes too thick. In a baking dish assemble the lasagna as follows: even layers of meat sauce, Mornay sauce, lasagna noodles. Repeat twice. Top with a final layer of Mornay sauce and a layer of Mozzarella. 11 layers in total. Bake in a 375 degree oven for 45 minutes, or until golden brown - like the picture below. Serve with warm crusty bread, a big glass of wine and stretch pants.